Written by Henry Lewis, Jonathan Sayer, Henry Shields. 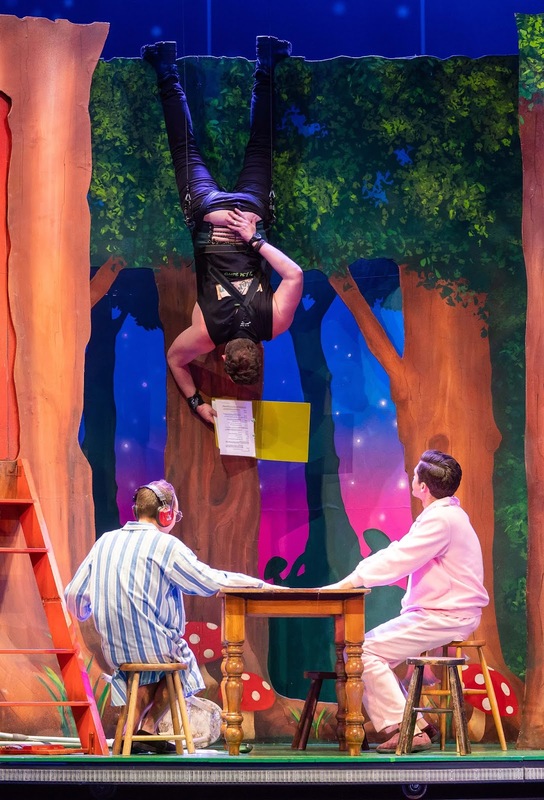 The cast of "Peter Pan Goes Wrong" in a tight spot. If you saw “The Play That Goes Wrong”, you’ll need no urging to see this new production by the Cornley Polytechnic Drama Society, because “Peter Pan Goes Wrong” is more lavish, funnier (if that’s possible), and more frenetic than their first production. But if you haven’t seen one of their productions yet, then this is your opportunity to catch up with the rest of the world. 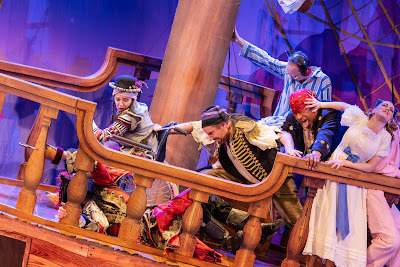 Probably the most incompetent theatre company in existence, the CPDC production of “Peter Pan” is a non-stop laugh-fest, as disaster after disaster overtake the long suffering cast. No point in describing what happens, that would spoil the fun. Most of the cast who survived “The Play That Goes Wrong” have returned as their original characters, Luke Joslin as the pompous director-in-waiting, Robert Grove; Adam Dunn as the burly, besieged stage manager, Trevor Watson; George Kemp as the world’s worst actor, Dennis Tyde, who still can’t remember his lines, Tammie Weller as the ambidextrous Annie Twilloil, barely coping with four roles as Mary Darling, Lisa, Tinker Bell and Tiger Lilly, Darcy Brown barely surviving as Peter Pan, and Francine Cain as the beauteous Sandra Wilkinson, over-acting her heart out as Wendy Darling. You’d have thought they would have had enough first time around. 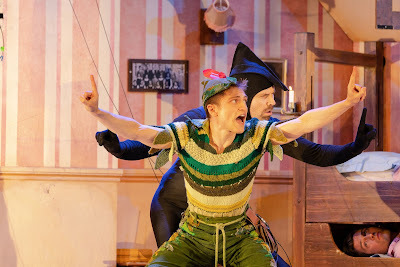 Darcy Brown and Luke Josling as Peeter Pan and his shadow. New to the cast are Connor Crawford hogging the limelight as the director, Chris Bean, who’s cast himself as George Darling and Captain Hook, Jordon Prosser as the devious Max Bennett languishing in the roles of Michael Darling and the crocodile, Teagan Wouters as the reluctant actor Lucy Grove, who overcomes her stage-fright and copious injuries to ultimately save the day, and jolly Jay Laga’aia who was greeted with lusty cheers from the kids in the audience as he took the stage as Francis Beaumont to narrate the play. George Kemp - Adam Dunn - Jordan Prosser share an anxious moment. The revolving set is a death-trap which barely survives the show, as furniture collapses, pieces fall off, doors jam, and actors find themselves mercilessly exposed trying to make magic among the mayhem, colliding mid-air in mal-functioning flying harnesses or dodging falling stage props. It’s all brilliantly executed, with split-second timing, combining superlative physical theatre, slap-stick comedy and good old-fashioned pantomime. The kids loved it, but not nearly as much as their parents. Don’t miss it.